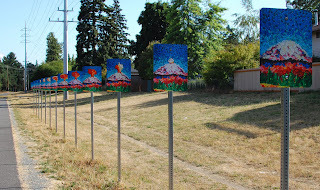 There are several art installations along the Interurban Trail that runs parallel to the seedy part of Aurora Avenue, in the upper reaches of northern Seattle. This one makes me wonder if Mount Rainier will wake up and surprise us some day. Kaboom!